Do you know who God is? He is holy and perfect. He is strong and loving. He knows everything, can do anything, and is everywhere at the same time! He is your Father in heaven, but He's not there alone. There is only one God, but in Him there are three persons. We call these three persons of God the Trinity, but you probably know them as the Father, the Son (Jesus) and the Holy Spirit. All are equally one God, and they can't be separated. The Holy Trinity is one of the great mysteries of our Faith. When we call something a mystery, we mean that God has chosen to teach us some things about it, but we can never fully understand. It's easier to remember each person of the Trinity by thinking about the particular jobs we associate them with. When we think of God the Father, we remember Him as the creator of the world and all things in it. We think of a Father who loves us perfectly, who takes care of us, and who teaches us the lessons we need to learn. God, the Holy Spirit is the helper who has always been with us, but was sent to the Church in a visible way at the first Pentecost, giving the apostles wisdom and courage to be leaders of the new Church. When you were baptized the Holy Spirit came to live in you, and He continues to give you all that you need to live in a way that makes God happy. We can learn much about Jesus, God the Son made man, by reading about Him in the New Testament. In John 10:11, 14-15, Jesus says, "I am the good shepherd. A good shepherd lays down his life for the sheep...I know mine and mine know me, just as the Father knows me and I know the Father; and I will lay down my life for the sheep. We are the sheep Jesus is talking about in this verse. Just like a shepherd, Jesus is always watching over us. He knows all about us and will do anything to take care of us. A shepherd protects his sheep from danger, and Jesus also keeps us safe from sin and evil. When we do sin, He is sad but always welcomes us back to His flock when we ask for forgiveness. A shepherd makes sure his sheep have plenty of food and water. Jesus feeds us with the Eucharist so we will be strong and good. "A good shepherd lays down his life for the sheep." John 10:11 Jesus did this for you when He dies on the cross. He loves you so much that He was willing to pay for your sins with His own life. Because of this perfect sacrifice, it is possible for you to go to heaven to live with Him forever. I will not be afraid because you are with me. You prepare a meal for me in front of my enemies. You give me great blessings. Surely your goodness and love will be with me all my life. 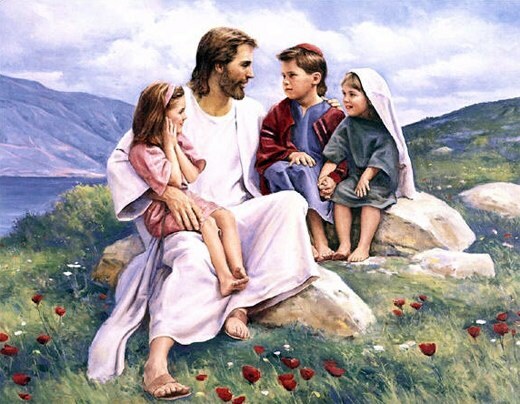 ​How can you tell Jesus loves the children? God and Jesus love you too. How do you know? - to make people holy. The first sacrament, Baptism, has always been the first step in receiving God's life. You can read in Acts 2:38 how Peter called people to repent of their sins and be baptized in the name of Jesus. Most Catholics are baptized as infants, but no matter what their age, when someone is baptized, their Original Sin is washed away, they are accepted into the Body of Christ (the Church), and are given the promise of heaven. The newly baptized person wears a white gown to show that he or she is a new creation in Christ. This year, you will be preparing to receive two sacraments. The first is the sacrament of Reconciliation (sometimes called Penance or Confession). In the sacrament of Reconciliation, we experience God's great love for us through His mercy. We see that we have sinned, and now we ask God to forgive us. The second sacrament you will prepare to receive is the Holy Eucharist. The Eucharist is the Body and Blood of Jesus. We can also call this receiving Communion. We are only baptized once in our whole life time, but can celebrate the sacraments of Reconciliation and Holy Eucharist over and over again. We prepare for Reconciliation first because we want to have a clean heart to receive Jesus in Holy Communion. Think about coming to your own table for a meal. You would not want to come to dinner with dirty hands, would you? Well, you certainly don't want to come to God's table with a dirty heart! Frequently receiving the sacrament of Reconciliation is a habit we want to establish so that our hearts are always ready to receive Jesus in the Eucharist. Parent(s) - Tell your child about the day they were born or came into your family. How did you get ready for their arrival? What was special about your child? How did you choose their name? Share with your child what you thought when you first saw him/her. Parent(s) - Tell the story of your child’s baptism. - Tell your child where they were baptized. - How did you celebrate their baptism? - Did you have a special event after the baptism? Child - Name some people who love you. How do you know they love you? Parent- Name some people who love you. How do you know they love you? How do we show love for others? How do we show love at home? How do we show love in our community? How do we show our love toward God? The items below are the symbols of your baptism. All of these objects are signs of God’s love for you. At our baptism you are initiated into God’s family. He loves you very much and he shows his love through signs and symbols. Our baptism is initiated by Christ because God wanted us to be part of his loving family. 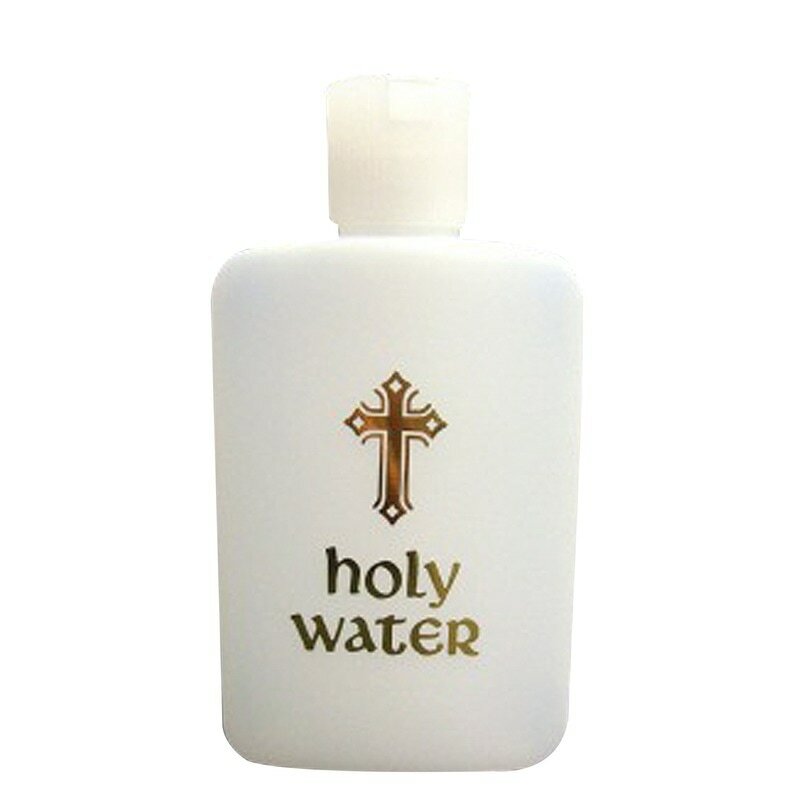 ​Holy Water: Symbol of cleansing. You are free from sin and are born new into the church. This is one of God’s greatest acts of love toward us. 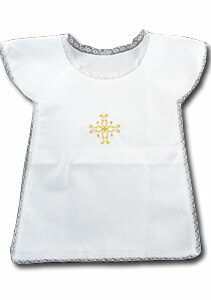 ​Baptismal Garment: Symbol of your purity. At our baptism we are guaranteed a new beginning; a new beginning in Christ and our adoption into the church. 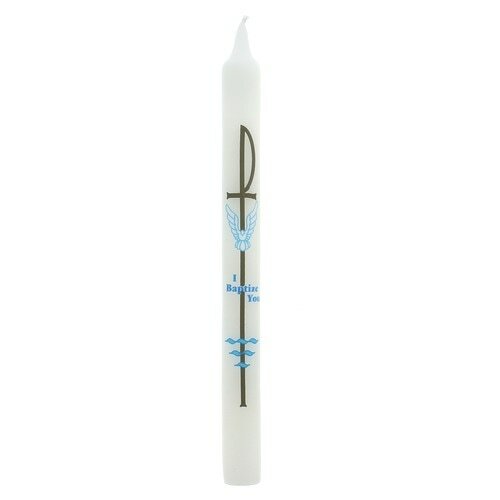 ​Candle: A symbol of Christ’s love for us. This is the light of Christ; he will always be with us as a flame in our hearts. We too are now the lights of the world. God says, I know you by your name ______________ . You are my child. You are very precious to me. I love you. I am always with you. ​Please watch the video and answer the questions together below. - Did you ever do something your parents did not want you to do? - How did you show that you were sorry? - How did your parents show that they forgave you? - How did you feel? When we say we are sorry or when we forgive others, our family becomes more loving. Help us to be more loving to each other. Parents tell your child that the Spirit of God is with us in our hearts and minds and helps us celebrate the Sacrament of Reconciliation. We pray the Apostle’s Creed at Mass because it reminds us of our faith in the forgiveness of sins. It was when Jesus gave the Holy Spirit to his apostles that he gave the power to them to forgive sins. The apostles passed that power on to their disciples who passed it on to Popes, Bishops, and priests. ​​Please watch the video below. ​Come, Holy Spirit, fill the hearts of your faithful, and light in them the fire of your love. Lord, by the light of your Holy Spirit, you have taught the hearts of your faithful. In the same Spirit help us love what is right and always rejoice in your consolation. ​Remember, we received the Holy Spirit at our baptism. This same Holy Spirit works in our lives to help us be like Christ. The Bible is God's written message for us. Because it is God's Word, it is an awesome source of direction for our lives. God, the Holy Spirit, inspired people to write the Bible. By reading God's Word often, you get to know God much better. By knowing Him better, you will be better able to figure out how He wants you to live your life. The Bible is full of great wisdom that tells you God's will. The Bible is also full of one more important ingredient for a strong Christian: prayer. When we pray to God, we are talking to Him. Whole books of the Bible are devoted to prayer, like the Psalms. Through prayer, we are sometimes better able to see God's will for us.